[ABOVE] A portrait of the photographer Samuel Fry (1835-1890) by William Gillard of Gloucester (c1885). The photographer William Gillard (born 1841, Bodmin Cornwall) was supplied with photographic dry plates by Samuel Fry's company. Copies of the above portrait were rubber-stamped "Negative on Kingston Special Plates - SAMUEL FRY & Co."
Samuel Fry was born in London on 24th February, 1835, the eldest child of Eliza Bennell and Arthur Fry (1809-1877). Samuel's father was a member of the famous Fry family, the prominent Quaker family which included Dr. Joseph Fry (1727-1787) the founder of the well known Fry's chocolate company and the owner of an important type foundry, Joseph Fry (1777-1861), the husband of Elizabeth Gurney (1780-1845), who as Mrs Elizabeth Fry became famous as a prison reformer and philanthropist, and Joseph Storrs Fry (1769-1835), who established a steam-driven chocolate factory and became the head of the famous chocolate firm of J. S. Fry & Sons. Arthur Fry, Samuel's father, was the youngest surviving son of Dr Edmund Fry (1754-1835), the famous type founder, designer of type fonts and compiler of Pantographia, a reference work which contained "accurate copies of all the known alphabets of the world". 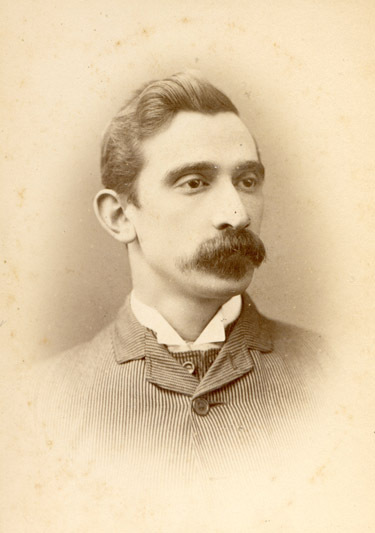 Samuel Fry was also related to the Fry family that settled in Brighton in the mid 1850s, a family which included three photographers - Clarence Edmund Fry (born 1840, Plymouth), Walter Henry Fry (born 1841, Plymouth), and Allen Hastings Fry (born 1847, Plymouth). 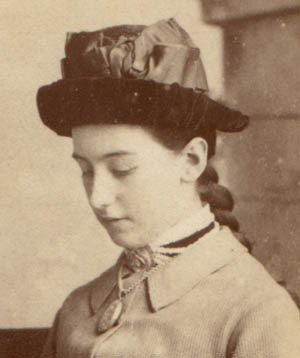 Another member of the Brighton Fry family, Lucy Elizabeth Laughton Fry (born 1844, Plymouth) married the photographer Joseph John Elliott (1835-1903), who established the famous London photography firm of Elliott & Fry with Lucy's eldest brother, Clarence Edmund Fry. As a young man, Samuel Fry chose to pursue a career in photography. In his early twenties, Samuel Fry worked as a photographer's assistant at one of the London studios of the London School of Photography. By the end of 1857, Samuel Fry had established his own photographic studio at 79 Kings Road, Brighton. On 7th June 1859, Samuel Fry married Jessey Perry (born 1840, London), the nineteen year old daughter of John Perry, at a ceremony in South London [ Marriage registered in the district of Newington, Surrey during the 2nd Quarter of 1859 ]. After his marriage, Samuel Fry returned to Brighton with his young wife. For the next year or so, Samuel and Jessey Fry resided at 79 Kings Road, Brighton, from where Samuel Fry carried on his photography business. Samuel and Jessey Fry's first child, Samuel Herbert Fry was born in Brighton in 1860 [ The birth of Samuel Herbert Fry was registered in Brighton during the 3rd Quarter of 1860]. Samuel Fry's photographic studio was situated above a jeweller's shop at 79 Kings Road, Brighton. In 1855, the building was occupied by Nathan Hyam, described as a "jeweller, lapidary, and watch & clockmaker" in a local trade directory. By the time Samuel Fry arrived in Brighton around 1857, the business at No. 79 had passed to William Cochran, another jeweller and watchmaker. It seems likely that Samuel Fry used the rooms on the upper storey of the building. A photographer's studio was often situated at the very top of a tall building in order to capture as much light as possible. Early photographic studios were often fitted with a glass roof or very large windows to let in the maximum amount of sunlight. 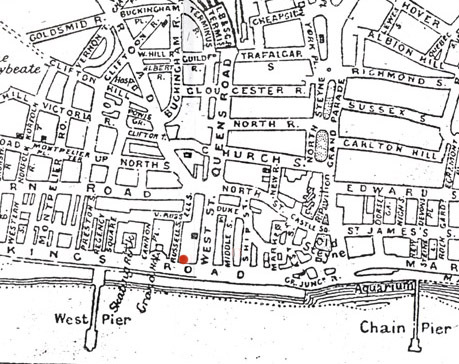 [ABOVE] A late 19th century map of Brighton showing the location of Samuel Fry's photographic studio at 79 Kings Road on Brighton's seafront. The West Pier was not built until 1866 and therefore would not have been a feature of Brighton's seafront during Samuel Fry's time in Brighton (1857-1860). [ABOVE] Portrait of an unknown man, a photograph taken by an anonymous photographer around 1858. During his early years in Brighton, Samuel Fry took Talbotype portraits based on William Henry Fox Talbot's calotype process, which employed waxed paper negatives, but he soon adopted Frederick Scott Archer's "wet collodion process" for his portrait work. The highly sensitive collodion plates produced sharper images for portraiture. In this example, the photographer's finger prints which marked the glass negative plate have appeared in the final print. Samuel Fry arrived in Brighton around 1857. By the end of 1857, Samuel Fry had established his own photographic studio above a jeweller' shop at 79 Kings Road, Brighton. During his three year stay in Brighton, Samuel Fry produced studio portraits and photographic views of the town. (See the photograph of the Old Steine bottom left). Fry's publicity leaflets distributed in Brighton mention that he was producing "Talbotype Portraits in the Highest Style of Art" at his Kings Road studio. This indicates that Samuel Fry was making salt print photographs from waxed paper negatives, a method modelled on the calotype process invented by the pioneer photographer William Henry Fox Talbot (1800-1877). The photographic prints which were made using Talbot's calotype process were popularly known as "Talbotypes" in honour of the inventor. Talbot had patented his calotype process in 1841 and professional photographers who wished to produce talbotype portraits were required to purchase a licence from William Henry Fox Talbot. By 1854, there were only nine photographic studios in England holding licences from Talbot and two of these were located in Brighton - Hennah & Kent's Talbotype Portrait Gallery at 108 King's Road and Grey & Hall's General Photographic Institution in St James's Street. Up until 1855, the two firms using Talbot's calotype process - Hennah & Kent of 108 King's Road and Grey & Hall of 13 St James' Street - had to pay to William Henry Fox Talbot, the patentee, an annual fee of between �100 and �150 for the right to produce Talbotype portraits. By the time Samuel Fry arrived in Brighton in 1857, the restrictions on the production of Talbotypes (photographic prints from waxed paper negatives) had been lifted. However, by 1858, Samuel Fry had turned to the "wet collodion" process for his portraiture. In 1851, Frederick Scott Archer, a sculptor and a member of the Calotype Photographic Club, had published details of his "wet collodion" process, which involved coating a glass plate with a mixture of potassium iodide and a sticky substance called collodion. ( Also known as "gun cotton", collodion was a transparent and adhesive material that had previously been employed in surgery to dress wounds ). The coated glass plate was then sensitized in a bath of silver nitrate. The highly sensitive collodion wet plates could produce high quality photographic negatives after exposures of only a few seconds. The wet collodion process was not only ideal for portraiture but it also lent itself to "outdoor photography". 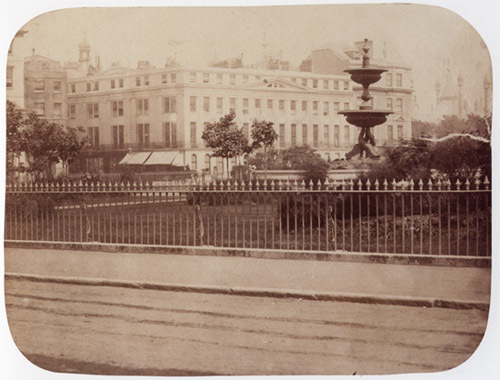 Between 1858 and 1860, Samuel Fry produced a number photographic views of Brighton, featuring famous landmarks and buildings of the town (e.g. The Old Steine, St Nicholas Church). During his time in Brighton, Samuel Fry became particularly interested in "instantaneous photography". The shorter exposure times allowed by the "wet collodion" process meant that photographers could capture fleeting moments with their camera. Samuel Fry was working and living in Kings Road, the main thoroughfare on Brighton's seafront. Fry's proximity to the sea allowed him to experiment with the faster photographic plates and between 1858 and 1860, he produced a number of "instantaneous" pictures of crashing waves, scudding clouds and ships caught up in rough seas. The instantaneous photographs produced by Fry during his stay in Brighton include pictures with titles such as "Sea and Clouds", "Waves of the Sea" and "A Heavy Sea at Brighton". (see descriptions below). Samuel Fry also employed "instantaneous photography" to capture interesting cloud patterns. The titles of the instantaneous photographs executed in Brighton, reflect Fry's interest in cloud formations : "St. Nicholas Church, Brighton: Natural Clouds " ; "A Break in the Clouds (Instantaneous)". Samuel Fry was clearly after an artistic effect and to these ends he often combined two or more negatives to produce a single composition. Samuel Fry operated a photographic studio at 79 Kings Road, Brighton from the beginning of 1857 until the end of the Summer of 1860. Samuel Fry is listed as a" Photographic Artist" at 79 King's Road in the 1858 edition of Melville & Co.'s Directory & Gazetteer of Sussex, Kelly's 1859 Post Office Sussex Directory and Robert Folthorp's General Directory for Brighton & Hove, published in 1859. Samuel Fry was still working as a photographer in Brighton when the birth of his first child Samuel Herbert Fry was registered in the seaside town during the third quarter of 1860. By November 1860, The Photographic News was referring the photographer as "Mr Samuel Fry, late of Brighton". During the period Samuel Fry worked as a photographic artist in Brighton, there were around twenty different individuals running their own photography businesses in this seaside resort, including William Constable, who had established the first photographic portrait studio in Brighton in November 1841, Robert Farmer, a chemist who had constructed a studio above his shop as early as March 1853, and William Lane, a carver & gilder who had been taking "portraits and views" using the wet collodion process on glass since September 1852. Brighton was also the location of the well respected partnership of Hennah & Kent, who had operated a Talbotype Portrait Gallery at 108 King's Road from around 1854. As an experienced professional photographer from London, Samuel Fry's scale of charges were likely to have been higher than the average charged by local tradesmen. Robert Farmer, the former chemist, charged "From One Shilling to One Guinea" for photographic portraits taken at his two establishments in Brighton's North Street. Customers would pay the same amount for portraits taken at the "Photographic Glasshouse" attached to the Cigar and Tobacco Depot at 9c St George's Road run by Samuel G. Cox and Miss Elizabeth Burnell ("Portraits taken in all weathers, from 1s to 21s"). It is likely that Samuel Fry's photography business in Brighton was squeezed by the well established high-class studios such as Hennah & Kent on one side and the competition from the cheap establishments, such as Cox & Burnell's Photographic Glasshouse, from the other end. [ABOVE] An instantaneous stereoscopic photograph of breaking waves by C. S. Breese (c1862). We have also been favoured by Mr Fry with a specimen of an instantaneous sea view. It is a representation of a stormy looking sea and sky. One or two vessels are seen scudding along, and a black angry-looking cloud to the left of the picture contrasts well with the gleaming sunshine in other parts, and seems to promise dirty weather. The waves are not so successful as to sharpness as some we have seen, but the light and shade are very fine, and the atmospheric distance with the sky, water, and we might almost say, wind, combine together to make a very effective picture. A commentary on "Sea and Clouds", an instantaneous picture by Samuel Fry, which appeared in The Photographic News on 11th November 1859. Samuel Fry later revealed that his instantaneous "sea studies" were made from combining two, three or four different negatives - a separate negative each for the sea, the sky and the boats. Close to the ground, and where, but for their remarkable appearance they would be passed by unobserved, are two instantaneous pictures of "Sea and Clouds" by Samuel Fry. The sombre, threatening appearance of the clouds seem to indicate an approaching tempest, and so perfect is the representation, that it excites a momentary sensation of alarm for the safety of the vessels tossed about by the rough waves. A commentary on "Sea and Clouds", an instantaneous picture by Samuel Fry, which appeared in a review of the London Photographic Exhibition published in The Photographic News on 17th February 1860. INSTANTANEOUS PHOTOGRAPHY - We have recently seen a very fine instantaneous photograph, produced by Mr Samuel Fry, late of Brighton. It is entitled "The Break in the Clouds". The sun is just peeping through a mass of cumulus clouds, and the rays striking downwards, and diverging as a fan, are beautifully reflected in the dark mass. The foreground, if the term is admissible in such a case, is a very finely depicted sea and boats on the beach. A review of Samuel Fry's instantaneous photograph entitled "The Break in the Clouds" which appeared in The Photographic News on 16th November 1860. Fry showed "The Break in the Clouds" and another instantaneous picture, entitled "Heavy Seas at Brighton" at the South London Photographic Society in November 1860. Samuel Fry was not the first person to photograph the moon, but he was amongst the earliest to produce successful stereoscopic photographs of the lunar surface. The first person to photograph the moon is reported to be the American photographic scientist John William Draper (1811-1882) who made a daguerreotype of the moon on 23rd March 1840, employing a camera exposure of twenty minutes. A number of photographs of the moon were taken by astronomers between 1849 and 1856 with the assistance of professional photographers. Warren De la Rue (1815-1889), an English astronomer began taking photographs of the moon in 1852 and he is recognised as the first to have produced successful stereoscopic views of the moon, either in 1856 or at the beginning of 1857. "My attention was first called to the photography of the moon, at the commencement of 1857, by having placed at my disposal the very fine equatorial telescope of Charles Howell Esq...which had just then been erected in a suitable observatory on the beach, about a mile from the town (Brighton). I determined to commence operations at once." The owner of the telescope was Charles Howell (1784-1867), a Fellow of the Royal Astronomical Society who resided at Dial House in Hove Terrace, near Shoreham Road, Hove. Between 1857 and 1859, Fry took a number of photographic images of the moon using Howell's equatorial telescope. Two of the more successful images (one taken on 23rd November 1858, the other on14th October 1859) were later combined to produce a stereoscopic glass slide of the moon. At the end of 1859, Fry issued the stereoscopic slide of The Moon with an explanatory pamphlet and chart, accompanied by a numbered key which identified particular features of the photograph. Fry's early photographs of the moon were favourably reviewed in The Photographic News on 21st April 1859. An improved version of Samuel Fry's stereoscopic photograph of the moon was described in The Photographic News of 11th November 1859 under the heading "The Moon in the Stereoscope". [ABOVE] A stereoscopic photograph of The Moon issued around 1859 by Samuel Fry of Brighton. Fry's experiments with lunar photography began in the early months of 1857, but he did not produce a satisfactory stereoscopic image until the following year. The two images in the stereogram illustrated above were taken separately. The first was photographed on 23rd November 1858 and the second was taken on 14th October 1859. Fry's earlier attempt to produce a "stereogram of the moon" was reviewed in The Photographic News on 21st April 1859. The reviewer commented: "Nobody can be more familiar than ourselves with the difficulties of obtaining a photograph of the moon of sufficient value to be used as a map; in which the mountains, craters and other features of the moon's surface are rendered with fidelity.......The stereogram by Mr Fry is a transparent positive, and, when seen by a powerful transmitted light, presents a distinct picture of the various features of the lunar surface; and is rendered of more value by the fact that each picture is accompanied with a paper photograph in which the principle points are numbered and indexed ". Fry's early stereograms of the moon were later referred to as "beautiful lunar photographs" by The Photographic News , but in an issue of the journal published on 11th November 1859, the reviewer acknowledged that the second version, illustrated above, "possesses some superiorities over those before noticed." [ABOVE] The caption to the stereoscopic photograph of The Moon by Samuel Fry (illustrated above). Samuel Fry began taking photographs of the Moon using Charles Howell's telescope at Howell's observatory in Hove early in 1857. A series of lunar photographs were produced over the following two years and a satisfactory "stereogram" of the moon was produced early in 1859 and reviewed in The Photographic News on 21st April 1859. A superior stereoscopic photograph of the moon was produced at the end of 1859, which was later issued with an explanatory pamphlet and chart. A paper photograph of the moon, marked with a numbered key, accompanied the glass stereoscopic slide. [ABOVE] The Railway Station by William Powell Frith, RA (1862). This large oil painting, now in the collection of the Royal Holloway College, was painted by W. P. Frith between 1860 and 1862. Frith apparently experienced difficulties with the complicated perspective and commissioned Samuel Fry to take photographs of the interior of Paddington Station, the steam locomotive and the railway carriages. [ABOVE] John Chester Craven's Locomotive No.12, photographed at the Lover's Walk Railway Depot, Brighton in May 1858. This photograph of a railway engine could have been taken by Samuel Fry when he was making Talbotypes in Brighton in 1858. 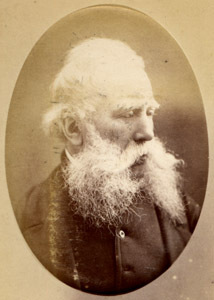 Louis Victor Flatou (1820-1867), the art dealer who commissioned Frith to paint The Railway Station. William Powell Frith, RA (1819-1909), the artist who painted The Railway Station between 1860 and 1862. Robert Howlett (1831-1858), a photographer ,who before his early death in 1858, had supplied Frith with photographs for his paintings Samuel Fry (1835-1890), the photographer who supplied Frith with photographs for The Railway Station. 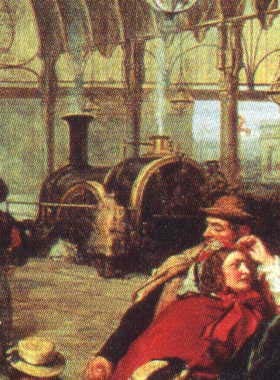 [ABOVE] A detail from The Railway Station by William Powell Frith, RA (1862), showing in the background the locomotive, the original of which Samuel Fry photographed for the artist in 1861. 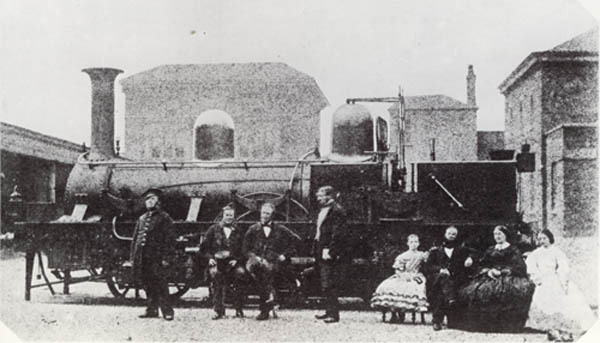 The artist William Powell Frith reportedly based his painting of the railway engine (in the left background of the picture) on a picture of "The Sultan" locomotive photographed by Samuel Fry in 1861. The "Sultan", which is described as a 4-2-2 broad gauge engine of the "Iron Duke Class" was a high speed locomotive (top speed 80mph) used for the Great Western Railway express passenger service out of Paddington. For patriotic reasons, the story was circulated that the railway engine painted by Frith was called the "Great Britain", another GWR locomotive in the "Iron Duke Class". The portly man in the buff-coloured coat standing in front of the locomotive and chatting to the engine driver, represents Louis Victor Flatou (Flatow). the London art dealer who, in September 1860. commissioned Frith's painting of The Railway Station. In September 1860, the famous Victorian artist William Powell Frith (1819-1909) was commissioned by the London art dealer Louis Victor Flatou (Flatow) to produce a large oil painting, provisionally entitled " Life at a Railway Station", which would show a large number of different characters about to depart from Paddington Railway Station. In his book, My Autobiography, Frith openly admitted his failure to master the "dreadful science" of perspective. It was probably for this reason that Frith asked Samuel Fry to provide a series of photographs which pictured a steam locomotive, a set of railway carriages and the vast interior of Paddington Railway Station. It is assumed that Frith was intending to use Fry's photographs as an aid to his painting. Four years earlier, in 1857, William Powell Frith had engaged the young photographer Robert Howlett (1831-1858) in the similar task of taking photographs of groups of figures and the Grandstand at Epsom to help him execute his famous painting of a racehorse meeting, entitled Derby Day (1858). "Mr. Samuel Fry has recently been engaged in taking a series of negatives, 25 inches by 18 inches, and 10 inches by 8 inches, of the interior of the Great Western Station (Paddington), engines, carriages, etc. for Mr. Frith, as aids to the production of his great painting 'Life at a Railway Station'. Such is the value of the photograph in aiding the artist's work, that he wonders now however they did without them!" 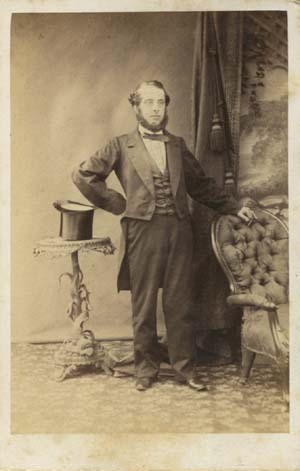 [ABOVE] Full length portrait of Samuel Fry taken around the time he established his photographic portrait studio at 83 Gracechurch Street, London E. C. (c1862). "Samuel Fry of Forest Hill - Respectfully reminds Friends that he is prepared to take photographs by his instantaneous process, of wedding parties, family groups, etc. Also of houses, gardens, and general scenery, of any description. On application, specimens and terms will be sent." It is clear from the advertisement in "The Friend" that in 1861 Samuel Fry was working primarily as an "outdoor photographer" and the majority of the portraits he took in this period were photographed on location, at the houses and gardens of his customers. With the increasing popularity of the new carte-de-visite format of portrait photography, it was important for Fry, if only for commercial reasons, to establish a photographic portrait studio in London. In 1862, Samuel Fry entered into a business partnership with the London photographer Charles Hamilton Colepeper (1842-1875) to form the firm of Fry & Colepeper. The portrait studio of Fry & Colepeper was short- lived and on 16th April 1862, the partnership between the two young photographers was dissolved. 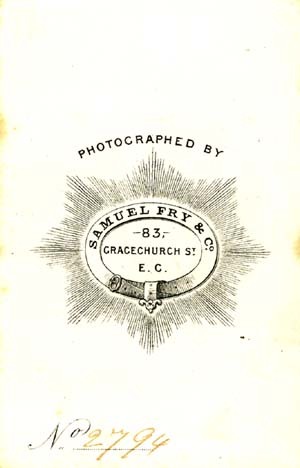 Shortly afterwards, Samuel Fry found some new business partners and established a photographic portrait studio under the name of Samuel Fry & Co. at 83 Gracechurch Street in the City of London. In February 1863, Samuel Fry placed an advertisement in "The Friend" magazine, giving details of his new "Portrait Establishment" in Gracechurch Street, offering "cartes de visite at 10 for 10s., and now with special arrangements for copying paintings, engravings and faded photographic portraits". The same advertisement was printed in the next edition of "The Friend", published the following month. Fry also placed a similar advertisement in the rival Quaker publication "The British Friend" in May 1863. The photographic portrait studio at 83 Gracechurch Street went under the name of Samuel Fry & Co. for about three years, from April 1862 until the Spring of 1865. During the early months of 1865, Samuel Fry was operating two studios - one in Gracechurch Street in the City of London and the other at his family home in Kingston-on-Thames. From early in 1865, Samuel Fry's cartes carry publicity for the portrait establishment at 83 Gracechurch Street, London E. C. and the studio attached to his residence at 9 Surbiton Park Terrace, Kingston-on-Thames. Fry was not able to be present at both studios, so he entered into a business partnership with two established London photographers - Frederick Aaron Gush (1817-1870), a former miniature painter, and William John Ferguson (1829-1900). Over the previous five years, Samuel Fry's business partners had operated a photographic portrait studio at 179 Regent Street, London under the name of Gush & Ferguson. Presumably, Gush and Ferguson supervised the running of the City of London studio. while Samuel Fry managed the business in Kingston-on-Thames. During this business arrangement, the studio at 83 Gracechurch Street operated under the name of The Globe Photographic Company. The partnership of Gush, Ferguson & Fry lasted until 27th July 1865, when Samuel Fry withdrew from The Globe Photographic Co. in order to concentrate on his photography business in Kingston-on-Thames. [ABOVE] A portrait of the photographer Samuel Fry seated at a writing desk (c1864). 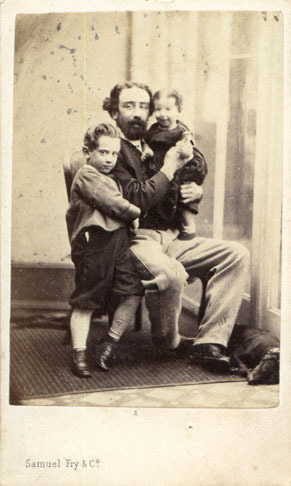 [ABOVE] A carte-de-visite portrait of Samuel Fry, photographed with his two children - Bertie (Samuel Herbert), who was then aged around five, and Samuel's young daughter, Beatrice Jessie Fry, who was born in Kingston-on-Thames during the 3rd quarter of 1864. This photograph was probably taken in 1865 at Fry's family residence at 9 Surbiton Park Terrace, Kingston-on-Thames. [ABOVE] Carte-de-visite (cdv) photographs . A sheet of albumen prints featuring the eight cdv portraits which had been captured on a single wet collodion plate. 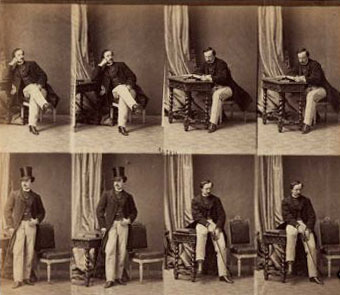 In this example the photographer has taken two shots of four different poses. The sheet is ready to be cut up to make eight separate carte-de-visite portraits. [ABOVE] Full length portrait of a young man seated at a desk, a carte-de-visite photograph by Samuel Fry & Co., 83 Gracechurch Street, London E. C. (c1864). Negative No. 2857. This portrait was probably just one of several poses the sitter was asked to adopt during the studio session that day. The original collodion glass negative probably also contained shots of the young man standing by the chair, seated at the table reading a book, and a few other poses similar to those featured on the contact print in the illustration above this carte-de-visite photograph. The studio of Samuel Fry & Co. at 83 Gracechurch Street concentrated almost exclusively on the production of carte-de-visite portraits. 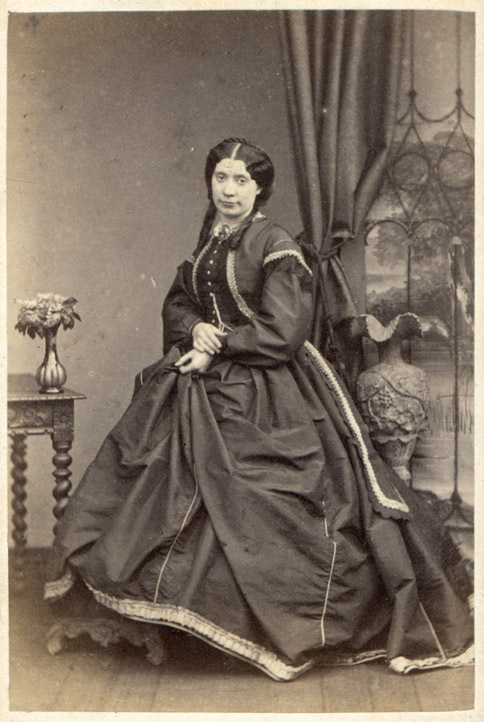 The carte de visite (cdv) format of portrait photography had been introduced into England from France in the late 1850s, but was approaching the height of its huge popularity when Fry opened his studio in the City of London in 1862. The carte de visite was a photographic portrait mounted on a small card (roughly 21/2 inches by 41/4 inches or 6.3 cm by 10.5 cm), the same size as a conventional calling card - hence the name 'carte de visite', the French term for visiting card. Many photographic portrait studios in the early 1860s were equipped with specially constructed 'carte-de-visite cameras', multi-lens cameras fitted with a photographic plate holder that could be moved around inside the camera to capture between four and twelve small portraits on a single glass negative. A professional photographer equipped with a multi-lens camera could take up to a dozen portraits, in a variety of poses, all on one camera plate. From the resulting negative, the photographer could produce a set of contact prints on albumenized paper. (see the illustration on the left). The thin, abumen paper prints were cut up and pasted on to small cards. The collodion glass negative, which held between eight and a dozen different images could be used repeatedly to produce multiple copies of the portraits in the carte-de-visite format. A studio photographer, after taking up to a dozen portraits in a variety of poses at a single sitting, could subsequently produce a large number of prints from a single glass negative, thereby greatly reducing the production cost of each portrait. 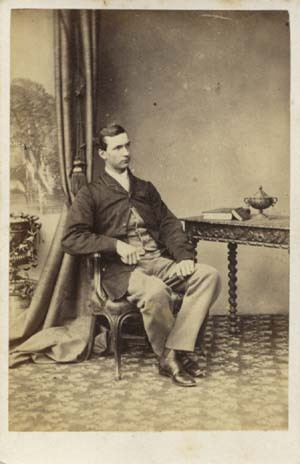 Samuel Fry's price for a set of carte-de-visite portraits ("10 for 10s") was fairly standard for the early 1860s. The prices offered were not particularly cheap, nor were they in the expensive bracket charged by "high class" photographic establishments. In 1862, the Brighton photographer William Hall was offering to provide a dozen cdv portraits at a price of 12 shillings ( 60 p.) which was about average for the period. [ In 1854, Hall and his partner Stephen Grey had charged 15 shillings (75p) for a single Talbotype portrait in a gilt frame ]. The new photographic portrait studio at 90-91 King's Road, Brighton, owned by the famous photographer John J. E. Mayall, offered a set of twelve cdv portraits for �1.1s (�1.05p) when the studio opened in July 1864. Hennah & Kent, another quality portrait studio in Brighton, "got 21/- a dozen for cartes" in the early 1860s. At the other end of the scale, The West-End Photographic Company, based at 109 Western Road, Brighton was charging 5s (25 p.) for twelve cartes de visite in 1864. At the same studio a single cdv portrait would cost 1 shilling ( 5 p.), three copies could be had for 2 shillings (10 p.), while six copies could be purchased for 3s (15 p.). A scale of charges based on the number of copies ordered was typical for photographic studios producing carte-de-visite portraits. Samuel Fry probably charged something like 1s 6d ( 7.5 p.) for a single cdv portrait, yet the customer could bring the unit price down to 1 shilling ( 5 p.) if he ordered ten copies of the same carte-de-visite. In December 1861, The Photographic News declared "At the present time, we believe cartes de visite are the most remunerative class of portraits produced by professional photographers." The Photographic News pointed out that the cdv's profitability stemmed from the fact they were "generally ordered in quantities." The cdv itself became an advertisement and generated business. As The Photographic News explained : "each one sent out is a recommendation and almost certainly brings fresh customers. Thus a sitter orders a dozen copies; in giving these to his friends, he places each one, to a certain extent under the obligation of giving a portrait in return; and thus it happens that every portrait taken becomes, as it were, the nucleus of a fresh order." In the period 1862-1865 there was a huge demand for carte-de-visite portraits. 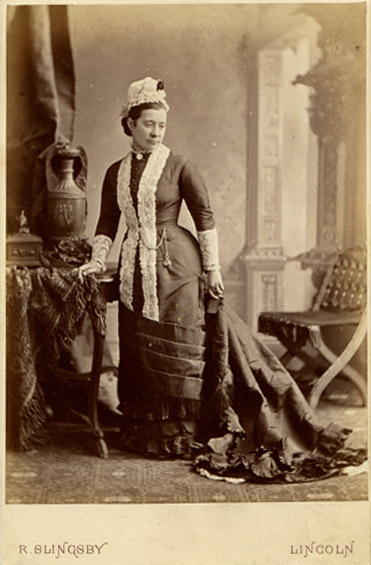 It is reported that in the early 1860s, the famous portrait photographer John J. E. Mayall produced over half a million cartes a year, which helped him secure an annual income of �12,000. A top London studio could expect, on average, around 30 sitters a day, although in the summer months the figure could be higher. In May 1861, Camille Silvy's London studio recorded 806 customers for that month alone. A provincial photographer reported that "fifteen in a morning was considered a good day's work, although in the summer it often rose to twenty-five." Samuel Fry's range of negative numbers suggests that on average his studio was taking around 1400 photographs a year. However, each sitting probably involved between four to twelve different poses and the majority of his customers would order multiple copies from the negative, so it is possible that Fry's Gracechurch Street studio was producing around 60,000 cartes a year. [ABOVE] The trade plate of Samuel Fry & Co. of 83 Gracechurch Street, London E. C., taken from the reverse of a carte-de-visite portrait (c1864). 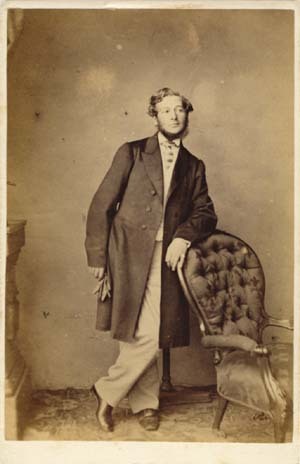 [ABOVE] Full length portrait of man with a fringe beard, a carte-de-visite photograph by Samuel Fry & Co., 83 Gracechurch Street, London E. C. (c1864). Negative No. 2898 [ABOVE] The trade plate of Samuel Fry of 83 Gracechurch Street, London and Surbiton Park Terrace, Kingston-on-Thames, taken from the reverse of a carte-de-visite portrait (c1865). When Samuel Fry established his photographic portrait studio at 83 Gracechurch Street, London, in 1862, he was a married man of twenty-seven with a wife and a young child. 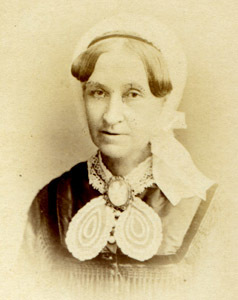 Samuel Fry had married Jessey Perry in 1859 when she nineteen years of age. During the 3rd Quarter of 1860, when Samuel was running a photographic studio in Brighton, his wife Jessey gave birth to a son named Samuel Herbert Fry. Not long after the birth of their first child, Samuel and Jessey Fry moved to Forest Hill in Kent. Around 1864, Samuel Fry settled in Kingston-on-Thames. 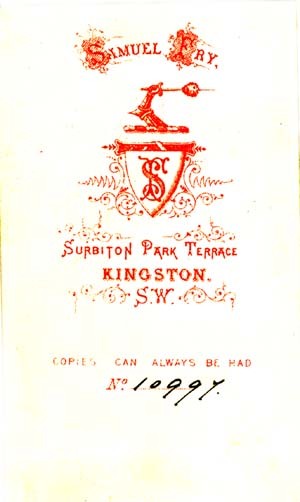 Samuel and his family set up home at 9 Surbiton Park Terrace, Kingston-on-Thames, where he also worked as a photographer. Beatrice Jessie Fry, Samuel and Jessey Fry's second child, was born in Kingston, Surrey, during the 3rd Quarter of 1864. While residing at 9 Surbiton Park Terrace, Jessey Fry gave birth to a baby boy, who was given the name Cecil Courtenay Fry [The birth of Cecil Courtenay Fry was registered in Kingston during the 3rd Quarter of 1871]. [ABOVE] The 1881 census return for Samuel Fry and his family, who were then living at Sherrington House, Grove Crescent, Grove Road, Kingston-on-Thames, Surrey. At the time of the 1881 census, Beatrice Fry, Samuel's daughter, was sixteen years of age. The following year Beatrice Fry married a young clerk named Rutland Saunders (born 1862, Westminster). Rutland Saunders later became an architect and by 1895 was working alongside his father in the family firm of Edward Saunders & Son, Surveyors, Land Agents and Architects. Cecil Courtenay Fry, Beatrice's younger brother, married in 1897 and at the time of the 1901 census was working as an electrical engineer in the St Pancras district of London. Cecil Fry was Samuel Fry's youngest surviving son. A baby boy named Leslie Reginald Fry was born during the Spring of 1884, but he died a few months later, during the Summer of 1884. 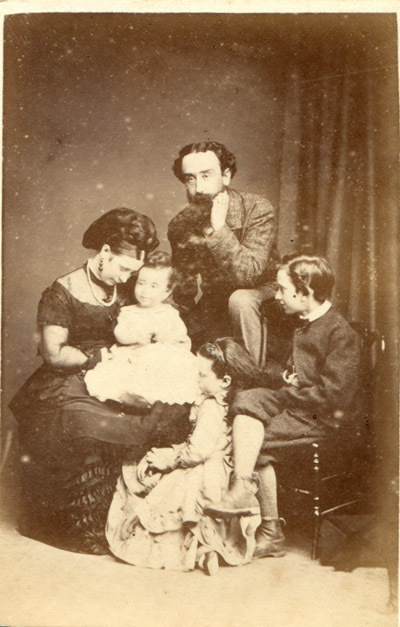 [ABOVE] A group portrait of Jessey and Samuel Fry with three of their children - Cecil Courtenay Fry (born 1871), on his mother's lap, Beatrice Jessie Fry (born 1864), crouching on the floor, and Samuel Herbert Fry (born 1860), sitting on a chair. ( c1873). A fourth child, a boy named Leslie Reginald Fry was born during the Spring of 1884, but he died in infancy. [ABOVE] The announcement of the marriage of Beatrice Jessie Fry, Samuel Fry's only daughter, to Rutland Saunders, as published in The Times newspaper on Thursday, 25th May, 1882. [ABOVE] Samuel Herbert Fry (born 1860, Brighton, Sussex). 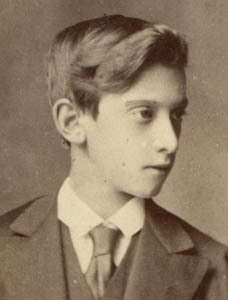 As a young man, S. Herbert Fry, Samuel Fry's eldest son, served as a Manager in his father's photographic firm. S. Herbert Fry, a photographer in his own right, became a Member of the (Royal) Photographic Society around 1885. [ABOVE] Beatrice Jessie Fry (born 1864, Kingston, Surrey) Samuel Fry's only daughter. In 1882, Beatrice Fry married Rutland Saunders, a London architect. [PHOTOS: Courtesy of David & Nicholas Fry] [ABOVE] Cecil Courtenay Fry (born 1871, Kingston, Surrey), the youngest surviving son of Samuel and Jessy Fry, did not become a professional photographer like his father and elder brother, but worked as an electrical engineer. [ABOVE] A portrait of Arthur Fry (1809-1877). Samuel Fry (born 1835, London) was the eldest child of Eliza Bennell and Arthur Fry. Louis Fry, Samuel's youngest brother, was a school master. Between leaving Brighton in the Summer of 1860 and establishing a photographic portrait studio in London early in 1862, Samuel Fry worked as an outdoor photographer. Samuel Fry's advertisements during this period indicate that he was prepared to take photographs of houses, gardens, "general scenery", wedding parties and family groups at their private residences using his "instantaneous process". According to Ron Callender's article on Samuel Fry in John Hannavy's "Encyclopedia of Nineteenth- Century Photography", the Kingston-based photographer "travelled in a horse-drawn van, which carried sufficient equipment to undertake views, groups and outdoor portraits". In his early days as an "outdoor photographer", Samuel Fry used Frederick Scott Archer's "wet collodion" process to take photographs of town views, landscapes and buildings. From the mid-1860s, Fry could employ the early types of photographic 'dry plate' that were then available, such as the 'collodio-albumen' and 'collodio-bromide' dry plates. However, these early forms of dry plate were very slow, requiring exposure times measured in minutes rather than seconds. The pre-gelatin dry plates of the 1860s were fine for static subjects such as landscapes and buildings, but unsuitable for outdoor portraits or for scenes that contained movement. Fry carried with him "some small-sized plates of a more rapid description, in case groups, portraits or animals have to be photographed". Fry was particularly interested in "instantaneous" photography, as his early 'sea studies', involving crashing waves and stormy clouds, testify. It is not surprising that Fry was a keen observer of the progress being made by George Eastman and others in the production of gelatine dry plates with exposure times of fractions of a second. Fry was probably experimenting with his own gelatine-based emulsions. By 1879, Fry was exhibiting his own "Gelatine Negatives" at the 24th Annual Exhibition of the Photographic Society of Great Britain and producing his own brand of dry plate. (See Samuel Fry and the Kingston Dry Plate Company below). During the mid 1880s, the firm of Samuel Fry & Co. were exhibiting bromide paper prints of outdoor subjects such as Exeter Cathedral and the New Eddystone Lighthouse. [ABOVE] An outdoor group portrait by Samuel Fry, featuring his eldest son, Samuel Herbert Fry, on horseback (c1870). 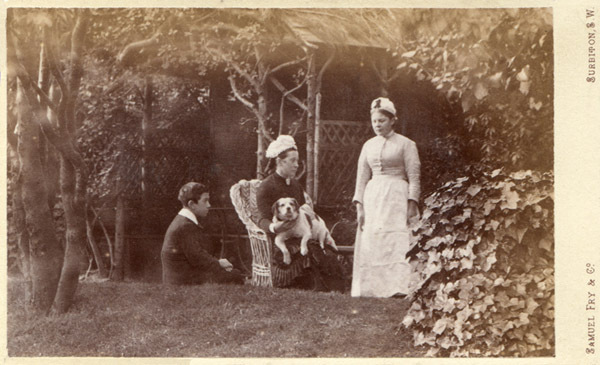 [ABOVE] An outdoor group portrait of his wife Jessey, his son Cecil and a family servant, photographed in his garden by Samuel Fry around 1880. 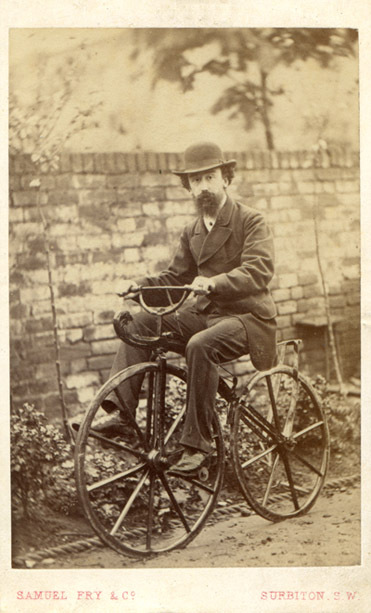 [ABOVE] Samuel Fry photographed on his bicycle. Samuel was a keen cyclist and a member of the Kingston Bicycle Club. Samuel Fry was still recorded as an active member of the Kingston Bicycle Club in 1887, when he was 52 years of age. (Bicycle & Camera, 12th June 1887). [ABOVE] This photograph of a building in Islington, North London was probably taken by Samuel Fry around 1867. 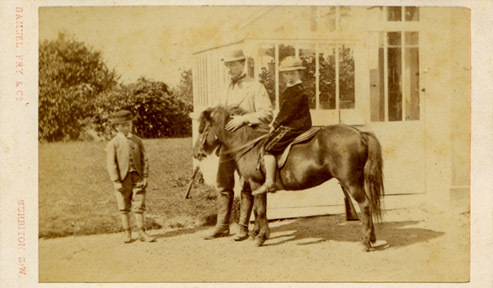 The boy on horseback is likely to be Samuel Fry's eldest son, Samuel Herbert Fry, who was born in 1860. 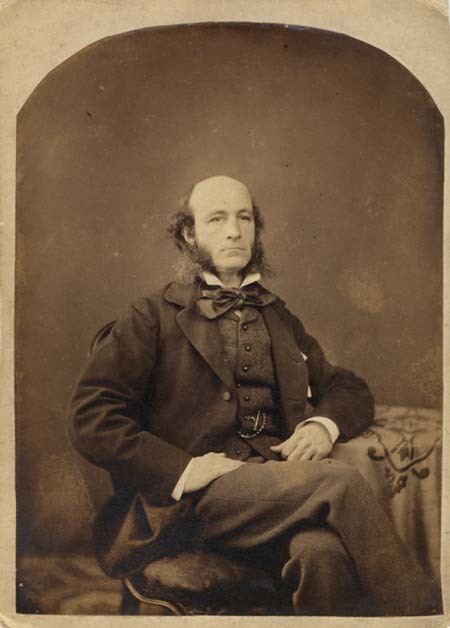 Throughout his photographic career Samuel Fry was regarded as a expert on photographic processes and an authority on the purposes of photography. 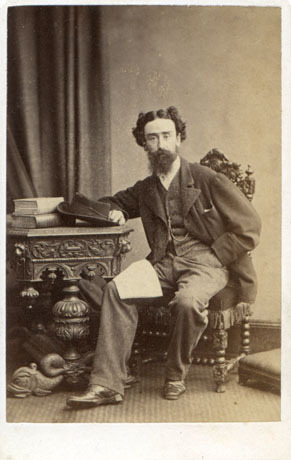 In his mid-twenties, Samuel Fry was writing articles for photographic journals on various photographic techniques. For instance, on 12th April 1861, Fry published an article in The Photographic News entitled "Printing on Ivory", in which he gave detailed instructions on how to transfer photographic prints onto sheets of ivory. Samuel Fry was an active member of the South London Photographic Society. On 16th November 1860, the twenty-five year old photographer delivered a lecture at the South London Society on the subject of "Instantaneous Photography and Composition Printing". It is reported that at meeting of the South London Photographic Society on 8th January 1863, "Mr Samuel Fry read a paper on Photography : its Retrospects and Prospects" to stimulate a debate on the future of photography. The following week, The Photographic News printed Fry's article in full and summarised the main points of his argument : "He thought greater things would be effected in photography if each artist were to select a given line, and stick to it, in preference to perpetually experimenting in different directions. He urged upon all photographers the effort to attain a higher artistic standard". It was Samuel Fry's view that photography was "entitled to rank as a fine art ". Fry came to the conclusion that "there is now more scope than ever for the artistic photographer .... Photography must take higher ground and assist in an incontrovertible manner its intimate alliance with the fine arts". Member of the Photographic Society (later The Royal Photographic Society) from November 1873. In 1875, Samuel Fry was a Council Member of The Photographic Society of Great Britain and exhibited two pieces in the Society's 20th Annual Exhibition. In 1874, Samuel Fry addressed the Liverpool Photographic Society, describing the design of his new photographic studio in Kingston-on-Thames with the aid of a wooden model of the proposed structure. Samuel Fry Forest Hill, LONDON S.E. S. Herbert Fry 17 Hilldrop Crescent, LONDON N.
After withdrawing from the London firm of Gush, Ferguson & Fry in July 1865, Samuel Fry continued working as a photographer at 9 Surbiton Park Terrace, Kingston-on-Thames. 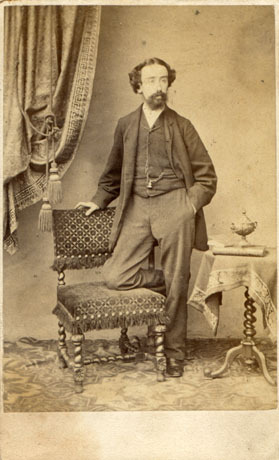 For the next 18 years or so, Samuel Fry continued to produce carte-de-visite portraits at the Surbiton Park Terrace studio. In 1875, Samuel Fry opened a new studio in Surbiton Park Terrace, but in November 1877 this studio was destroyed in a fire. Fry had to build another studio to replace the one that had burnt down, and the new studio was not opened until the end of the following year. (The American publication Anthony's Photographic Bulletin did not announce the opening of Samuel Fry's new studio in Surbiton until December 1878). 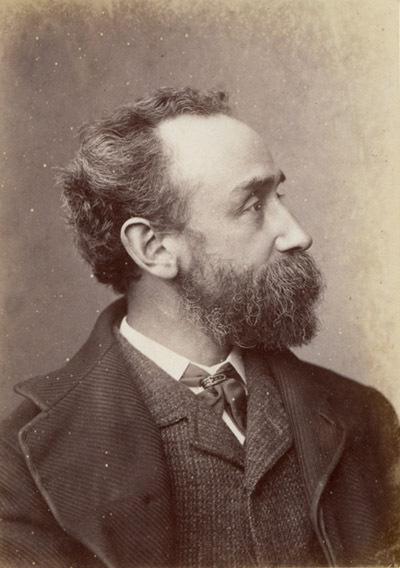 After five years in his new premises, Samuel Fry sold his studio at 9 Surbiton Park Terrace to George Thomas Jones (born 1844, St. Pancras, London), a London photographer based in Surbiton. Since 1879, Samuel Fry had been manufacturing dry plates at his photographic works in Kingston-on-Thames. (See the text under Samuel Fry and the Kingston Dry Plate Company in the panel below). The decision to sell his photographic studio at 9 Surbiton Park Terrace around 1885 indicates Samuel Fry's resolve to concentrate on the photographic materials side of his business. [ABOVE] The trade plate of Samuel Fry of Surbiton Park Terrace, Kingston-on-Thames, taken from the reverse of a carte-de-visite portrait (c1875). By the late 1870s, Samuel Fry was devoting more time to the technical and practical aspects of photography and, in particular, the recent advances in the production of gelatin (gelatine) emulsions for photographic plates. In the 1860s, Fry, like the majority of professional portrait photographers, was using the collodion wet plate process, first introduced by Frederick Scott Archer in 1851. Using the "wet plate" method, the photographer had to coat the glass photographic plate evenly with the sticky collodion solution immediately before use, and each stage of the process - sensitizing, exposing and developing - had to be done while the plate was still wet. "Wet plate" photography was difficult enough in the studio and darkroom, but outdoor photography was particularly troublesome. A photographer who wanted to operate away from his studio would have to carry with him a large amount of heavy equipment, including glass plates, a tripod, bottles of chemicals and some sort of portable darkroom, as well as the bulky camera itself. Attempts were made in the 1860s to produce 'dry plates' for photography. Glass plates were either coated with alternate layers of albumen and collodion or an emulsion of silver bromide in collodion. The "wet plate" process had to be carried out in the 10 to 20 minutes it took for the collodion to dry. In contrast, these pre-coated 'dry plates' could be stored, used in the camera when required and processed when convenient. However, these early "dry plates", were not very light sensitive and required exposure times of up to fifteen minutes. The search continued for a substance that could bind light sensitive materials to the glass plates, but allowed fast exposure times. In 1871, Richard Leach Maddox (1816-1902) a doctor with a strong interest in photography, proposed the employment of gelatine (gelatin), the transparent substance obtained by boiling animal bones, skin etc. which was commonly used to make jellies. Dr Maddox's idea was taken up by other experimenters, including amateur photographer Charles Harper Bennett (1840-1927), who discovered that prolonged heating of the gelatin-silver bromide emulsion would increase its sensitivity to light. Applying this method, Charles Bennett was able to produce dry plates with exposure times of a fraction of a second. Within months of Bennett's discovery, 'gelatine dry plates' were being manufactured on a large scale. By the end of 1878, four English manufacturers, including Charles Bennett himself, were offering photographic "dry plates" for sale. Samuel Fry was an early enthusiast of "dry plate" photography. In 1879, Samuel Fry was displaying his "Gelatine Negatives" at the 24th Exhibition of the Photographic Society of Great Britain and the following year he exhibited a portfolio of prints taken from gelatine negatives and a photograph entitled "The Thames; Winter and Summer", which had also been produced from a gelatine negative plate. [ABOVE] Samuel Fry, photographed by Augustus Lafosse of Manchester. A portrait taken around the time Samuel Fry set up the Kingston Dry Plate works (c1880). [ABOVE] George Eastman, the American inventor and founder of the Eastman Kodak Company, photographed by Paul Nadar in 1890. Samuel Fry was one of the first professional photographers in England to establish a photographic works which could manufacture photographic 'dry plates' on a large scale. Samuel Fry was in contact with George Eastman (1854-1932), an American inventor who had developed his own 'dry plate' emulsion in 1879 after studying the technical details of Charles Harper Bennett's discovery. George Eastman devised a machine that could efficiently coat glass plates with his own formula of gelatine-silver bromide emulsion. 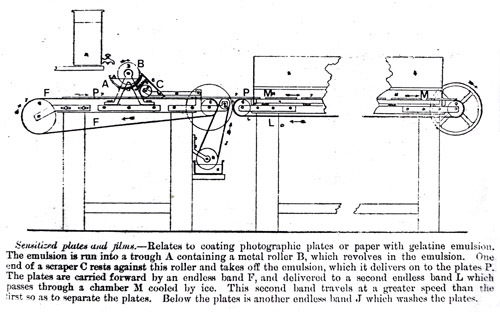 In 1879, Eastman travelled to England to patent his "dry plate" coating machine ("Method and Apparatus for Coating Plates", patent No.226,503, granted 1879) and in July of that year, he negotiated with two English firms in order to provide them with a license to use his plate-coating machine. In a letter dated 13th October 1879, Eastman gives an account of his negotiations with the two English parties, one of whom was a manufacturer of "Gel plates" and the other who "did not have the cash to pay down, but made me a very good offer to work it on a royalty basis with a fair sum down besides". Eastman admitted that he accepted the latter's offer "more to get the machine working on a large scale than anything else". George Eastman did not name the English licensees in this letter, but in another letter he clearly states that "the English patent is being used by Mawson & Swan and Samuel Fry & Co." Writing in 1879 about the transition from using collodion wet plates to employing gelatine dry plates, Samuel Fry wrote "when great difficulties were looked for, none were found". George Eastman regularly corresponded with Samuel Fry to give an account of the progress of his "dry plate" experiments. 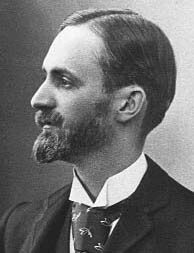 In April 1880, after he had already sold the English rights to his plate-coating machine and was seeking to establish his own factory in the United States to mass produce photographic dry plates, George Eastman chose to write to Samuel Fry to inform him that he had found suitable business premises in Rochester, New York and had leased the "entire third floor of a large building in the heart of the city". On 11th July 1880, Eastman wrote to Samuel Fry to advise him that he had "just ordered another application filed for an English patent", adding "it is a big thing and I will write you about it hereafter". In a later letter, Eastman gave further details about his new and improved plate-coating machine - "It is not expensive to make, simple, easy to clean, works as rapidly as anything heretofore devised, is adjustable to any size plate. In short, it is an eminently practical apparatus for every one who uses emulsion in large or small quantities". Samuel Fry had already set up a photographic works in Kingston-on-Thames. By 1880, Samuel Fry had established a factory to produce 'ready made' dry plates on a large scale ( The plate-coating machines modelled on George Eastman's invention were coating up to 12,000 plates a day). Some photographers prepared their own 'dry plates' at home, but the factory-produced dry plates had clear advantages. Manufactured gelatin dry plates were evenly coated by machine and were consistent in quality and could be stored for weeks or months before exposure and development. Initially, manufacturers had difficulty in maintaining the quality of their dry plates during extremes of hot and cold weather. However, gelatin-silver emulsion formulas were soon improved to withstand extreme weather conditions. In an advertisement published in The Photographic Journal in 1881, Samuel Fry & Co. Ltd promoted their own special brand of photographic dry plates, the "Kingston Special", which, it was claimed, "preserve their qualities indefinitely in any climate". By 1883, Samuel Fry & Co. Ltd were supplying their "Kingston Special Plates" to photographers in America through the Scovill Manufacturing Company. 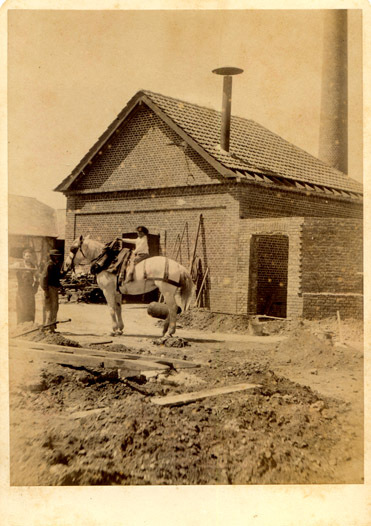 By the early 1880s, 'gelatine dry plates' were being manufactured on an enormous scale. Samuel Fry & Co. Ltd. of Kingston-on-Thames, together with Wratten & Wainwright of Croydon, Mawson & Swan of Newcastle and A. H. Harman's Britannia Works in Ilford, was one of the leading dry plate manufacturers in England in 1879. By 1880, there were more than 14 firms manufacturing photographic "dry plates" and over twenty different brands of pre-prepared plates were on the market. 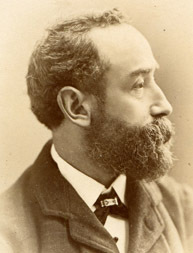 Peter Stubbs, the creator of the EdinPhoto website, discovered that the 1884 edition of W. K. Burton's "ABC of Modern Photography" contained advertisements for ten of these brands. In addition to Samuel Fry's "Kingston Dry Plates", Burton's handbook includes advertisements for Rough's Gelatine Plates, Paget Dry Plates, Cowan's Gelatino-Chloride Plates, Archer Dry Plates (H. W. Prestwick), Crystal Palace Dry Plates (Nelson, Dale & Co.), Wratten & Wainwright's Dry Plates, Pall Mall Dry Plates (R. W. Thomas & Co.), the famous Britannia Dry Plates from Marion & Co. and Edwards' Dry Plates, manufactured by B. J. Edwards of Hackney). [ Benjamin Joseph Edwards (1838-1914) was a photographer and inventor who had patented his own Plate-Coating Machine in 1884. For a brief period between 1877 and 1878, B. J. Edwards worked as a portrait photographer on the Sussex coast at 21, White Rock Place, Hastings]. Samuel Fry was involved in the production of photographic dry plates at his Kingston-on-Thames factory until his retirement through ill-health in July 1890. 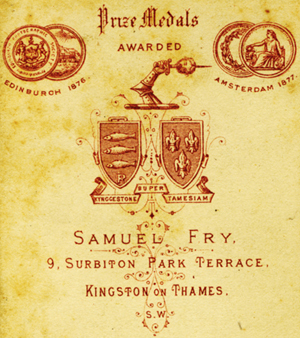 The firm of Samuel Fry & Co. Ltd., the manufacturers of Kingston Dry Plates, continued under Samuel Fry's eldest son Samuel Herbert Fry until the Summer of 1892. 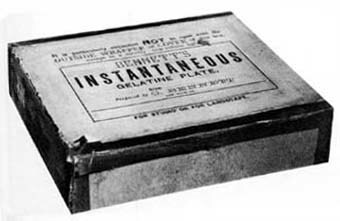 [ABOVE] A pack of Bennett's Instantaneous Gelatine Plates, one of the first commercially produced photographic dry plates. Charles Bennett started to manufacture his "Instantaneous Gelatine Plates" shortly after he had perfected the gelatine dry plate process in 1878. [ABOVE] A drawing of B. J. Edwards' Plate Coating Machine from the abridged patent dated 5th June 1884 (British Patent No.8643). Benjamin Joseph Edwards (1838-1914) was a London photographer and inventor who patented his Plate Coating Machine in 1884 and over the next ten years supplied a number of these machines to some of the leading 'dry plate' manufacturers, including G. Cramer's plant in the United States and A. H. Harman's Britannia Works in Ilford, East London (see the illustration at the foot of this column). Edwards' machines were capable of coating about 1,200 plates per hour. [ABOVE] The trade mark of Samuel Fry's Kingston Dry Plate Company. Photographic prints were occasionally rubber-stamped with the words "Negative on Kingston Special Plates - SAMUEL FRY & Co." for promotional purposes. The brand name "Kingston Special Plates" derived from Kingston-on-Thames, where Samuel Fry manufactured the photographic dry plates. [ABOVE] Details of the London office of Samuel Fry & Co. Limited, dry plate manufacturers, at 5 Chandos Street, Charing Cross, London, from an advertisement published in 1891. Samuel Fry's firm produced photographic dry plates, bromide papers, card mounts and photographic chemicals at the factory in Kingston-on-Thames. 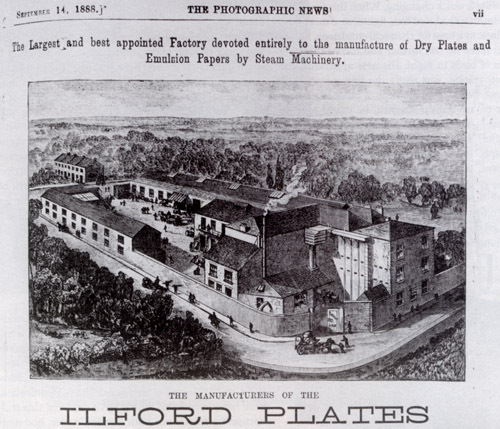 [ABOVE] An advertisement from The Photographic News, dated 14th September 1888, publicizing The Britannia Works Company, the manufacturers of Ilford Plates, at this time the best-selling photographic dry plate in the world. 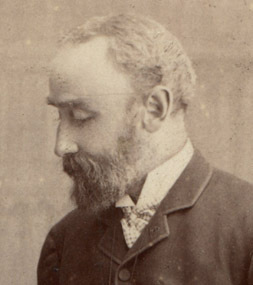 Alfred Hugh Harman (1841-1913) had founded The Britannia Works in Ilford, Essex in 1879. Around the same time, Samuel Fry had established his own dry plate factory in Kingston-on-Thames, Surrey, where gelatine coated plates were made and packaged on a large scale. Samuel Fry died in Kingston-on-Thames on 28th September 1890 at the age of fifty-five. Samuel remained true to his Quaker beliefs until the end of his life and was buried in The Religious Society of Friends (Quakers) Burial Ground at Kingston-upon-Thames. An obituary appeared in the British Journal of Photography on 3rd October 1890. The British Journal of Photography Almanac for 1890 recorded the passing of Samuel Fry in its list of important figures in the field of photography who had died that year. The entry in the BJP Almanac read: "Samuel Fry (September 28), for many years a professional portrait photographer, and more recently well known as a dry plate manufacturer." In 1911, at the age of seventy-one, Samuel Fry's widow Mrs Jessey Fry married Edward Franklin. Jessey died in Brentford, Middlesex in 1929 at the age of eighty-eight. [ABOVE] Samuel Fry (1835-1890), photographed towards the end of his life. [ABOVE] A portrait of the photographer Samuel Herbert Fry (1860-1921), a photograph taken at the studio of Herbert Barraud at 263 Oxford Street, London (c1890). 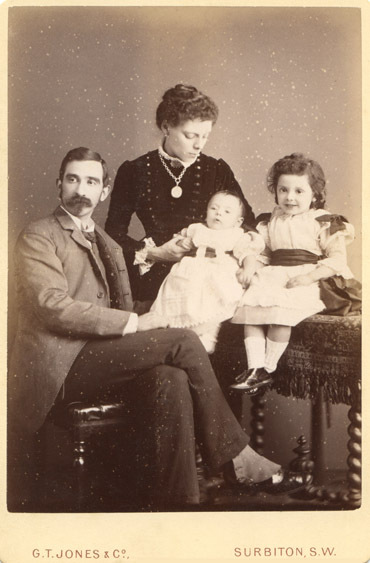 [ABOVE] A group portrait of Samuel Herbert Fry and his family in 1886. 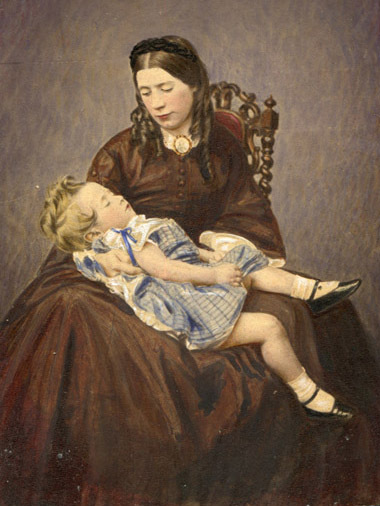 Samuel Herbert Fry's wife Edith holds Arthur Bertie Edmund Fry (born 1885). Seated on the table is Jessey Edith Fry (born 1882). 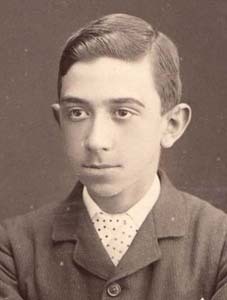 [PHOTO: Courtesy of David & Nicholas Fry] Samuel Herbert Fry was born in Brighton in 1860, the eldest child of the photographer Samuel Fry and his wife Jessey Perry. Samuel Herbert Fry's father had worked as a photographic artist in Brighton and London before settling in Kingston Upon Thames. By the time he was twenty years of age, Samuel Fry junior was working as a Manager in his father's photographic business. By 1880, Samuel Fry senior was operating a photographic portrait studio in Surbiton Park Terrace and running a photographic works in Kingston-on-Thames, where gelatine dry plates were manufactured on a large scale. Towards the end of 1881, Samuel Herbert Fry married Edith Emma Smith (born 1857, Camberwell, Surrey) at Croydon in Surrey. [Marriage of Samuel Herbert Fry and Edith Emma Smith registered in the district of Croydon during the 4th Quarter of 1881]. The marriage between Samuel and Edith Fry produced two children - Jessey Edith Fry (born 1882, Kingston-on-Thames, Surrey) and Arthur Bertie Edmund Fry (born 28th September 1885, Kingston-on-Thames, Surrey). By 1885, Samuel Herbert Fry's father, Samuel Fry senior, had disposed of his photographic studio at 9 Surbiton Park Terrace, Surbiton, to George Thomas Jones & Co. For the next five years, Samuel Fry senior concentrated on the photographic materials side of his business, producing gelatine dry plates, bromide papers, card mounts and 'enlargement chemicals' at his factory in Kingston-on-Thames. Samuel Fry's declining state of health forced him to retire in July 1890, and the reins of the Kingston Dry Plate Company were passed to Samuel Herbert Fry, his eldest son. S. Herbert Fry became the owner of Samuel Fry & Co. Ltd on the death of his father in September 1890. Two years later, on 4th August 1892, the Kingston Dry Plate Company (Samuel Fry & Co. Ltd) was placed into liquidation. According to David Webb, a photo-historian who has made a special study of London photographers, Samuel Herbert Fry then set himself up in business as an optician. On 1st January 1894, the trade journal The Optician and Photographic Trades Review reported the winding up of Samuel Herbert Fry's optician's business. Samuel Herbert Fry was a photographer in his own right and from 1885 he was a member of The Photographic Society (known as The Royal Photographic Society from 1894). 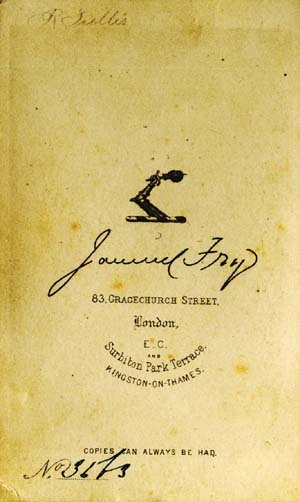 He generally exhibited his photographic work under the name of S. Herbert Fry. In 1886, at the 31st Annual Exhibition of The Photographic Society of Great Britain, S. Herbert Fry displayed two sets of enlargements on bromide paper, entitled "Views at Mickleham". By 1898, S. Herbert Fry was a Fellow of the Royal Photographic Society and at the 43rd Annual Exhibition of The Royal Photographic Society, he exhibited a work entitled "When the Shadows Lengthen", a photographic print which had a price tag of two guineas. When S. Herbert Fry exhibited his work in 1898, he gave his address as 17 Hilldrop Crescent, North London and he is listed here in the Post Office London Directory for 1899. At the time of the 1901 census, Samuel Herbert Fry and his family were living at 11 South Villas, Camden Square, St Pancras, London. On the census return, Samuel H. Fry is described as a "Photographer", aged 40. Edith Emma Fry, Samuel Herbert Fry's wife, died in St Pancras, London, during the 3rd Quarter of 1909, at the age of 52. Before the end of the year, Samuel Herbert Fry married again. His new bride was forty-year old Marion Beatrice Smith. [The marriage of Samuel Herbert Fry and Marion Beatrice Smith was registered in the North London district of Islington during the 4th Quarter of 1909]. At the time of the 1911 census, Samuel Herbert Fry, recorded as a fifty-year old "Trade Photographer", was living with Marion and one domestic servant at 19 Ridgmount Gardens, St Giles, London, in the Bloomsbury district of central London. Samuel Herbert Fry retired to the village of Dunsfold, near Godalming, Surrey, where he died on 8th July 1921 at the age of sixty-one. 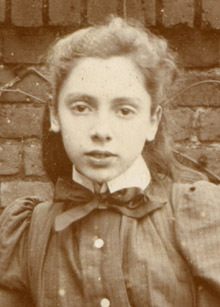 [ABOVE] Jessey (Jessie) Edith Fry (born 1882, Kingston-on-Thames, Surrey), Edith and Samuel Herbert Fry's eldest child. Jessey Fry, also known as Jessie, married Sidney Charles Foster in 1909. 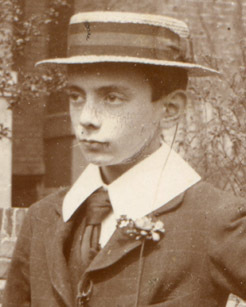 [ABOVE] Arthur Bertie Edmund Fry (born 1885, Kingston-on-Thames, Surrey), Edith and Samuel Herbert Fry's second child. Arthur Bertie Fry married Kathleen Edith Trill in 1911. I am indebted to David Fry and Nicholas Fry for providing the photographs of various members of the Fry Family for this webpage. David Fry has also kindly supplied family history information relating to Samuel Fry, his wife Jessey Perrey and their children Beatrice Jessie Fry, Cecil Courtenay Fry and Samuel Herbert Fry, David Fry's great grandfather.